art by michael perchard: Officially Spring? First Full Day Of Spring In USA! Officially Spring in the USA! Somebody should notify the weather! Woke this morning to more snow! Boston broke all time snow record! 109.1 inches! Not able to paint much lately! Hurt my shoulder! Maybe too much snow shoveling and snow roof raking! Hope to soon get to all my art blogging buddies' blogs to write comments. Hi Michael, how terrible! I hope your shoulder mends quickly! 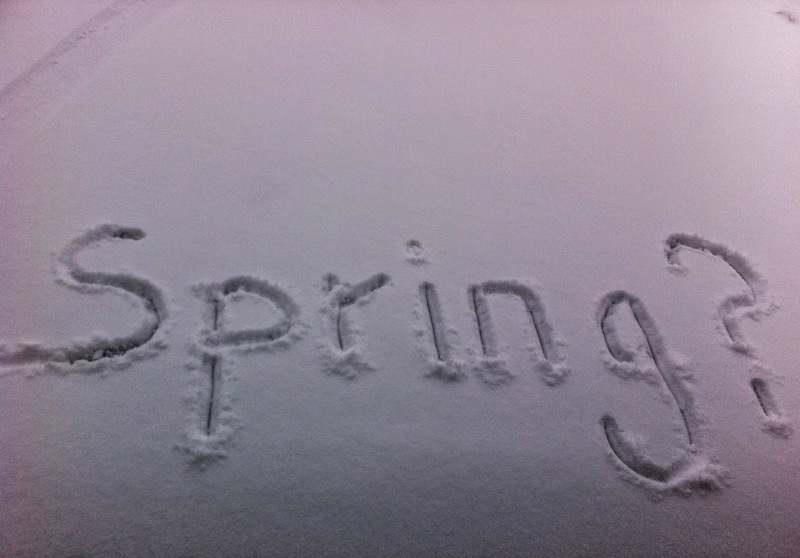 Definitely an odd way to celebrate the first day of Spring, will it ever melt? Sending you many healing hugs and warmer spring-like temps! Thanks Celia! Had cortisone shot the other day! Hope it works. Hard even to type! May start painting with left hand! Grazie buddy! Celia took the words right out of my mouth. Hang in there; warmer temps are headed your way--and do let the sun do the shoveling! I'm SO sorry to hear about your shoulder Michael...More than likely it is from shoveling.! Every time I hear about Boston's weather I think of you!!! You really got blasted ...more than New York. We had heavy snow two days ago and as fast as it came ..that's how fast it left us...However, its been pretty cold! I NEED the Spring weather! I need to hear the birds chirping!! Heal swift and heal strong, Michael so you can get back to painting. We need to see your energetic creations - they inspire us so! Superbe ! J'aime beaucoup ton travail !!! Merci beaucoup Cath! Always so very nice to make a new art friend! Thank you for visiting and writing such nice words! Votre ami Michel! Sorry to hear about your shoulder. Hopefully the recovery will be quick when you can stop lifting the shovel. lol Take care, my friend. You poor thing Michael!! I hope your shoulder heals very quickly. I can't believe how much snow you have had this winter - no wonder your shoulder was overworked on the end of the shovel! Hopefully beautiful spring weather will arrive very soon for you. I am looking forward to seeing photos of your crocuses emerging! La semaine dernière, j'ai pu déjeuner dehors, les températures étaient très agréables... mais aujourd'hui le printemps est capricieux et je le soupçonne de flirter avec Dame Hiver ! Hi Michael, Sorry to read about your shoulder injury. May it heal quick and strong and you can return to painting again! Well my friend as you know we are at polar opposites in weather. You guys get extreme winter and more snow than usual we get almost none, or rain either which we desperately needed. It's been like summer here lately. The seasons have essentially skipped over us!. The two of us may have to solve this ourselves! I propose a Boston/LA Trade Agreement for next year. You are Boston's Ambassador after all! You get too much rain or snow? ...you ship it to us to fill our reservoirs in exchange for sunshine and warmer temps which we send to you. We will have to work out the details but something like an exchange rate of every cubic ton of snow for an hour or so of sun. I mean if you have to shovel it anyway's why not shovel it into a crate! Don't yet know how to box up sun rays but we'll figure it out. We'll even remove the particulate matter for you and send only the best pure and wholesome rays. Thanks buddy! My shoulder is now on the mend! Still some pain after cortisone shot but now I am able to sleep through the night! I did start some painting. Very slowly returning. Working on smaller works! Again, I wish so much rain for you in Southern California! Horrible! I am on the mend and hope to post some work soon! I have been fooling around with iPad but not the same! Take care David and thanks so much! Michael Hoping For Water For CA! Hi Michael. Haven't checked on you for a while. So sorry to hear that darn snow caused injury. Glad to hear you are on the mend. Spring like weather coming soon! Hi Susan! Thanks so much for stopping by! Thanks also for your kind words. Shoulder is still on the mend. Trying to do some painting! Ever so slowly getting back to art. Don't want to rush things and re-injure the shoulder! You are right about spring weather. This Sunday maybe in the high fifties, low sixties, and sunny!!! Yippee! Take care Susan! Just want you to know that I am missing you, Michael, and hope all is well. Susan, Thank you so much for thinking of me! So very nice of you! I am okay! Still nursing my shoulder! Not painting much lately but slowly on the mend and hopefully back at the easel soon! Your On The Mend And Grateful Art Buddy!